All the information you need to help your event run smoothly! How do I reserve my moon bounce? You can simply call 1-866-GoJumps (465-8677) and reserve with our event planner, or you can sumbit a Rental Request Form online. We return calls in the order they are received, as soon as possible. We will contact you as soon as possible to make arrangements for payment of the required $50 deposit. How soon should I reserve my moon bounce? We are booking from 4 to 6 weeks in advance. If you have a specific moon bounce that you are interested in renting, it is a good idea to reserve it early. Have an event this weekend? 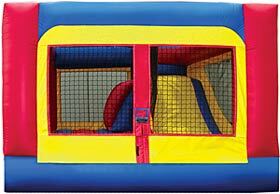 Don't worry... we should be able to provide you with one of our awesome bouncers to keep the kids entertained. Give us a call to see what's available! 1-866-GoJumps (465-8677). What kind of space do I need? The moon bounce needs to be set up on a piece of land that is mostly flat and free from sticks, rocks, and animal feces. Review the specifications for size of area needed on the bouncer page of your choice. We prefer to set up on grass, but we will set up on concrete or other surface as your needs require. We will need to know this in advance to properly prepare and setup in time for your event. What are the electrical requirements for my moon bounce? Each moon bounce requires 1 or 2 dedicated circuits that can handle up to 20 amps of electricity. After set up, the blowers use 7 - 10 amps to keep the moon bounce inflated. The blowers must be plugged, turned on, and running the entire time that the moon bounce is being used. The moon bounce needs to be set up within 100 feet of the electrical outlet. If you do not have a circuit that will provide enough electricity, we can rent you a generator for an additional fee. How long do I get to keep my moon bounce? We charge by the event, not by the hour. Just tell us when you want us there to set up and when you want us back to pick up, and we will be there! What are your delivery hours? We know that every event is unique, and we will do everything possible to accomodate the delivery times that work for you. Does GoJumps provide an attendant, or do I need to supervise the kids myself? Please plan in advance to have a volunteer (or rotating volunteers) assigned to supervise the children and enforce safety rules the entire time the moon bounce is being used. If you would prefer, we can provide (for an additional fee) an attendant to supervise the children and kindly, but firmly, enforce safety rules. Can I have my moon bounce set up at a park or community center? Definitely. Please check with the park authority or community center as to their requirements. What if it rains? It is our goal at GoJumps for our customers to have a SAFE and fun experience with our moon bounces. It is not safe to use a moon bounce in adverse weather conditions such as rain, lightening, high winds, or snow. GoJumps reserves the right to cancel a moon bounce rental if adverse weather conditions are forcasted. We offer Indoor Combos that can be set up in a basement or garage, or we will happily to work with you to reschedule your rental for a future date. What if it I need to cancel? You have until 7 a.m. on the morning of your event to cancel for any reason. You will receive a full refund of your deposit as long as you cancel by this time.